Alexander John McLachlan was born to Alexander McLachlan, a sheep farmer of Narracoorte, and his wife Mary, née Patterson, on 2 November 1872. His mother was a devout woman who read the Gaelic Bible to him each night, and taught him Gaelic songs. All his life he retained a strong attachment to, and interest in, his Scottish heritage, his parents and grandparents having emigrated from the Western Highlands. He was born after the death of four other children and his mother doted upon him. He was educated at home, at the Hamilton Academy in the Western District of Victoria, at Mount Gambier High School in South Australia and, finally, with a tutor in Adelaide. In 1890 he became an articled clerk, first with the solicitors Davison and Daniel in Mount Gambier, then with Grundy and Pelly in Adelaide. He was admitted to the Adelaide Bar in 1895. McLachlan commenced his law practice in the South Australian town of Gladstone in 1895, before acquiring the practice of E. H. Limbert in nearby Petersburg (since 1917 Peterborough) later in the year. In 1897 he was invited by his friend and mentor, Charles Kingston (then Premier), to become a partner in the latter’s Adelaide law firm. The two men continued in partnership until 1905 when McLachlan joined V. P. Vandenbergh, Kingston, according to McLachlan, having spent more time on politics than law. McLachlan’s practice would continue to flourish within various partnerships including that of McLachlan, Napier and Browne, and McLachlan, Reed and Griffiths. In 1906, McLachlan, with E. W. Benham, revised The Magistrate’s Guide. Deciding to try for politics, McLachlan first stood as an independent in April 1896 for the House of Assembly seat of Victoria, which took in Mt Gambier and other places in the south-east of South Australia. His youthful age of twenty-three brought some critical reaction, but the satirical Quiz and the Lantern argued: ‘If he is talented let us by all means utilize his talents. Don’t let us wait until his hair has fallen out and his eyes are dim’. McLachlan campaigned for free (and higher) education, the simplification of the legal system, and ‘early closing’ legislation to restrict the sale of alcohol. He was unsuccessful. Undeterred, he tried once more in 1905 when he stood, again unsuccessfully, for the Southern District in the Legislative Council, describing himself as a ‘neutral’ candidate. When Kingston’s death created a vacancy in the federal seat of Adelaide, McLachlan stood at the by-election in June 1908 as an independent. Campaigning for individualism, as opposed to socialism, he was defeated by the Labor candidate by 234 votes. He had not been able to count on non-Labor support, such as that of the National Defence League. As an old friend wrote when the campaign opened: ‘You are a liberal undoubtedly, but the Defence League’s backing will not recommend your candidature to those who are your natural allies—and the League vote will certainly not go solidly for you for I know you are too honest to trim for it’. His defeat in his bid as a Liberal for the seat of Adelaide in the federal election of 1910 was overwhelming. By 1909 he had begun to work tirelessly for the Liberal cause in Adelaide, becoming one of the founders of the Liberal Union, a fusion of the Australian National League (National Defence League), the Liberal and Democratic Union and the Farmers’ and Producers’ Political Union. His service to the Liberal Union included that of first vice-president. Nonetheless, in 1912 he was defeated as a Liberal Union candidate for the Legislative Assembly seat of Adelaide. Following the death of Joseph Vardon in 1913, McLachlan became the union’s second president. In December 1922 he decided once again to try for a seat in the federal Parliament, this time for the Senate, and astonished his friends by relinquishing what was considered a promising career at the Bar. (In fact he had been disappointed by the Chief Justice, Sir George Murray, not supporting his becoming King’s Counsel). McLachlan campaigned strongly but was defeated once again. However, he consolidated his role as a South Australian Liberal, working for the formation of the Liberal Federation in 1923 and eventually becoming a life member of its council. As chairman of the directors of the Liberal Club Ltd, he organised the building of the party’s new premises, which opened in May 1925. On 1 June 1898 McLachlan had married Cecia Antoinette Billiet in St Andrew’s Presbyterian Church, Adelaide, and in 1925 they left for an overseas holiday. While in Lyons in France, McLachlan received a cable advising him of the forthcoming federal election and asking if he would return home because as a past candidate he had been selected to contest the Senate election. McLachlan was elected in November 1925. In the meantime, he was chosen by the State Parliament to fill the casual vacancy caused by the resignation of Senator Benny. He was therefore eligible to take his seat on 24 February 1926. Some five months later, McLachlan was ‘amazed and flattered’ when the Prime Minister, S. M. Bruce, asked if he would join the Cabinet as an honorary minister in order to act as Attorney-General for J. G. Latham from August 1926 to February 1927. The newspapers heralded his appointment, the West Australian marvelling at the speed of his promotion. McLachlan expected to relinquish his ministerial duties on Latham’s return but stayed on in the Cabinet as a ‘sort of offsider to the Prime Minister’, Bruce having failed earlier to include a South Australian representative in the Cabinet in his anxiety to favour ability over provincialism. McLachlan was useful to Bruce in other ways, piloting a number of bills through the Senate, and, at the time of the opening of the provisional Parliament House in Canberra, accompanying the Duke and Duchess of York on visits to the Western District of Victoria and to Adelaide. McLachlan felt ‘perfectly at home’ in Parliament, though its ‘air of languor’ he found very different from the atmosphere of the courts. Parliament to him was ‘like a huge school’, where most of the ‘boys’ let public opinion decide their actions. There were party pressures, too, which could change senators’ voting intentions within hours. He was amused to see how often ‘an attack of lumbago’ served to mask a change of mind. While a loyal party member, he would retain a measure of independence as when in 1942 he supported, with Senator Spicer, the Curtin Government’s Statute of Westminster Adoption Bill. In 1928 McLachlan led the Australian delegation at the ninth assembly of the League of Nations at Geneva, after signing the Treaty for the Renunciation of War (Kellogg Pact) on behalf of Australia. The Brisbane Courier quoted The Christian Science Monitor’s description of McLachlan at Geneva as ‘a physical, as well as an intellectual, giant’, but McLachlan himself felt his conscience ‘torn asunder’, believing that the League of Nations was doomed. In 1935 he urged support for Abyssinia, stating that Australia must either accept its obligations or leave the league. The league’s failure strengthened McLachlan’s interest in imperial defence, underlining his belief that Australia’s ‘only hope . . . lies in a strong British Commonwealth of Nations’. In August 1929, McLachlan, who held extensive commercial interests, with directorships in several industrial and insurance companies, worked with Earle Page on the Life Insurance Bill, which provided for comprehensive regulation of the life insurance industry. After the fall of the Bruce–Page Government, McLachlan reintroduced the bill as a private senator’s bill. It passed the Senate in July 1930 but made no progress in the House of Representatives. The need to regulate life insurance was reflected in McLachlan’s own experience. From 1929 he was chairman of the Commonwealth Life (Amalgamated) Assurances Ltd, which for much of the 1930s was involved in legal disputes arising from a takeover bid. Now firmly established in federal politics, at the December 1931 federal election McLachlan topped the Senate poll for South Australia as a United Australia Party candidate. A ‘moderate protectionist’, whose political views were seen as ‘liberal and progressive’, he became Vice-President of the Executive Council and Minister in Charge of Development and Scientific and Industrial Research in the Government of Joseph Lyons. In February 1932 he presented the Government’s Insurance Bill. The bill, which was rushed through Parliament to pre-empt action by the Government of J. T. Lang in New South Wales, required insurance companies to deposit funds with the Commonwealth Treasurer. More time-consuming was the Customs Tariff Bill of 1933, which provided for the first new tariff schedule since 1920, and which McLachlan managed to steer through the Senate despite backbench protest, especially from the Country Party and the low-tariff supporters in the UAP. He served also as Acting Attorney-General and Acting Minister for Industry from March to August 1932, one ministerial responsibility being his attendance at the opening of Sydney Harbour Bridge on 19 March by the controversial J. T. Lang. Of more significance was his introduction of an important amendment to the Acts Interpretation Act 1904–1930, which declared invalid regulations made within six months of the disallowance of a similar regulation. 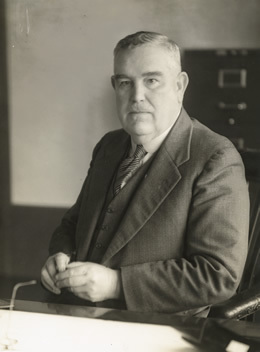 McLachlan acted again as Attorney-General from March to July 1934, and by October 1934 was Postmaster-General, having piloted through the Senate in 1932 the legislation establishing the Australian Broadcasting Commission. He would hold the position for the next four years. Quick to defend postal rates and radio licences, he encouraged the expansion of commercial broadcasters. One of his more agreeable tasks at this time of rapid expansion in postal, telephone and broadcasting services was to officiate at the opening of the telephone service between the mainland and Tasmania. Re-elected for the UAP in the October 1937 federal election, McLachlan continued as Postmaster-General, becoming also Leader of the Government in the Senate, and serving as Acting Attorney-General and Acting Minister for Industry during the absence of R. G. Menzies from March to September 1938. McLachlan’s enthusiasm for insurance legislation did not wane. In June 1938 he hastily facilitated the passage through the Senate of the National Health and Pensions Insurance Bill—an attempt to provide comprehensive insurance based on contributions from consolidated revenue, employers and employees. The bill had passed both houses but, according to McLachlan’s memoir, Lyons was having second thoughts. In fact national insurance had become a major issue in an increasingly divided party. On 3 November McLachlan was advised that a question would be asked in Parliament about a possible conflict of interest concerning himself as Postmaster-General and his position as chairman of directors of the Hume Pipe Company. Moreover, he learned that Cabinet had discussed the matter during his absence on Senate business. When the Prime Minister sent for him, McLachlan offered his resignation. On the adjournment of the Senate, McLachlan read the letter he had written to the Prime Minister in which he said it was ‘a degradation of democracy that such a charge should be made’, and that his personal honour was ‘dearer’ to him ‘than all the pelf in the world’. His resignation caused a sensation. The Sunday Sun and Guardian considered that few believed that conflict of interest was the point at issue. McLachlan himself later wrote that the reason for his downfall was ‘to remove from Cabinet one who it was felt would never yield on the question of national insurance’. Soon after his resignation McLachlan learned that Lyons’ recommendation for his appointment as a Privy Councillor had been refused. A heated exchange of correspondence followed, in which McLachlan stated that this rejection ‘appeared as rubbing the salt into a wound’. McLachlan, now on the backbench, had some five years to serve in the Senate during which time he was briefly a member of the Regulations and Ordinances Committee. A consistent advocate of imperial defence and conscription, he was the first chairman (1941–44) of the Joint Committee on War Expenditure, remaining in the position after the Labor Government of John Curtin came to power. McLachlan’s wife died in 1941, causing him to describe his marriage as forty-three years of unalloyed happiness. He had been admitted to the Victorian Bar in 1929 and about that time he and Cecia had made Melbourne their home, living also at a small grazing property, ‘Mill Park’, not far from South Morang. In 1943 McLachlan failed to gain preselection for the Senate, polling only 8 out of 200 votes on the Liberal Country League executive. He was forced to admit that in South Australia he had come to be regarded as a Victorian. When his term expired on 30 June 1944, it brought to an end over eighteen years of service in the federal Parliament. His autobiography, McLachlan: An F.A.Q. Australian, was published in 1948. In addition to his political activities, McLachlan was Chief of the Caledonian Society from 1899 to 1902, during which time he was involved in the erection of a statue to the explorer, John McDouall Stuart, which he unveiled at a ceremony in Victoria Square, Adelaide. He was also the commanding officer of the South Australian Scottish Infantry, formed at the time of the Boer War. He was chairman of the South Australian Football League from 1920 to 1925, and had also indulged a passion for racing. He played golf, bridge and billiards. A huge man in weight, height and voice, he had developed a reputation in Parliament for his oratory. It seems that when it was known he was going to speak, senators would fill the chamber. One newspaper described him as a spellbinder, ‘one of the old stock actors of Victorian days . . . if not always convincing . . . at least very delightful’. McLachlan was a connoisseur of antiques and had a fine collection of silver. He died, childless, at the Mercy Hospital, East Melbourne, on 28 May 1956, and was cremated at Springvale (Melbourne) after a state funeral, his estate left largely to his nephews. Tributes poured in, colleagues farewelling him as an elder statesman whose career had been distinguished in law, business and politics. Earlier, a journalist had written of him as ‘a most difficult man to quarrel with’, amiability being ‘the essence of this vast roly-poly South Australian’. A. J. McLachlan, McLachlan: An F.A.Q. Australian, Lothian Publishing Co., Adelaide, 1948; Liberal Leader (Adel. ), 26 Apr. 1922, p. 2; Advertiser (Adel. ), 12 June 1908, p. 6; The editor is indebted to the University of Adelaide for information. Quiz and the Lantern (Adel. ), 7 May 1896, p. 8; McLachlan, McLachlan, pp. 55, 59, 118–20; Register (Adel. ), 26 May 1905, p. 5; Letter to A. J. McLachlan, 27 May 1908, A. J. McLachlan Papers, PRG 342/1/6, SLSA; Advertiser (Adel. ), 12 Sept. 1913, p. 18, 20 July 1929, p. 16; McLachlan, McLachlan, pp. 99, 116–17; Liberal Leader (Adel. ), 1 June 1925, p. 3. McLachlan, McLachlan, pp. 121–2, 126–9; SAPP, Report of the Joint Sitting of the Two Houses of Parliament, 24 Feb. 1926; CPD, 3 Mar. 1926, p. 1201; West Australian (Perth), 11 Sept. 1926, p. 10. McLachlan, McLachlan, pp. 126–30; Herald (Melb. ), 7 Sept. 1926, p. 4, 15 Sept. 1926, p. 4; CPD, 4 Mar. 1927, pp. 113–14, 13 Dec. 1927, pp. 3035–6, 4 May 1928, pp. 4655–8, 9 Oct. 1942, pp. 1567–9. CPP, Report of the Australian delegation to the League of Nations, ninth assembly, 1929; Brisbane Courier, 8 Dec. 1928, p. 14; McLachlan, McLachlan, pp. 135–61; CPD, 13 Nov. 1935, pp. 1521–4, 5 Aug. 1931, pp. 4945–6, 2 Sept. 1937, pp. 449–53. McLachlan, McLachlan, pp. 94–9, 149; CPD, 22 Aug. 1929, pp. 189–97, 28 Aug. 1929, pp. 324–7, 27 Mar. 1930, pp. 584–7, 10 July 1930, p. 3963; Commonwealth Life Assurance Society Ltd v. Brain (1934–35) 53 CLR 343, Commonwealth Life Assurance Society Ltd v. Smith (1937–38) 59 CLR 527; NSWPD, 10 Nov. 1938, pp. 2600–1; SMH, 11 Nov. 1938, p. 15. Herald (Melb. ), 30 May 1931, p. 15; CPD, 24 Feb. 1932, pp. 167–9, 31 May 1933, pp. 1990–4, 8 June 1933, pp. 2191–8; Geoffrey Sawer, Australian Federal Politics and Law 1929–1949, MUP, Carlton, Vic., 1963, p. 61. McLachlan, McLachlan, pp. 168–9; CPD, 4 May 1932, pp. 309–17; Robert Walsh and John Uhr, ‘Parliamentary Disallowance of Delegated Legislation: A History of the Basic Provisions in the Acts Interpretation Act’, Legislative Studies Newsletter, no. 10, 1986, pp. 11–20; CPD, 5 May 1932, pp. 371–2; Advertiser (Adel. ), 17 May 1937, p. 19, 15 July 1937, p. 18, 23 July 1937, p. 31, 8 Nov. 1938, p. 18; Herald (Melb. ), 8 Oct. 1938, p. 11; CPD, 30 Nov. 1937, p. 9. CPD, 21 June 1938, pp. 2335–46, 3 Nov. 1938, p. 1189, 4 Nov. 1938, pp. 1313–15, 1322, 9 Nov. 1938, pp. 1373–4; A. W. Martin, Robert Menzies: A Life, vol. 1, MUP, Carlton, Vic., 1993, pp. 240–7; Sunday Sun and Guardian (Syd. ), 6 Nov. 1938, p. 4; Advertiser (Adel. ), 4 Nov. 1938, p. 29; Argus (Melb. ), 4 Nov. 1938, p. 1; DT (Syd. ), 4 Nov. 1938, p. 1; McLachlan, McLachlan, pp. 224–8, 253–62. CPD, 22 Sept. 1939, pp. 1069–74, 1 Dec. 1939, pp. 1945–7, 18 Feb. 1943, pp. 859–62; Paul Hasluck, The Government and the People 1939–1941, AWM, Canberra, 1952, pp. 367–8, 420–1; Herald (Melb. ), 8 Sept. 1941, p. 6; McLachlan, McLachlan, pp. 273–5. Graham Loughlin, ‘McLachlan, Alexander John’, ADB, vol. 10; Herald (Melb. ), 30 May 1931, p. 15; Advertiser (Adel. ), 30 May 1956, p. 3; CPD, 29 May 1956, pp. 1003–5, 11 Apr. 1935, p. 1259; McLachlan, McLachlan, p. 125; Herald (Melb. ), 8 Oct. 1938, p. 11. This biography was first published in The Biographical Dictionary of the Australian Senate, vol. 2, 1929-1962, Melbourne University Press, Carlton, Vic., 2004, pp. 245-250.